Earlier in the lucid cycle, there was support added to remove OEM-Config (and ubiquity) after it was finished running and completing it's tasks. This is achieved currently by running apt-get purge in the oem-config-firstboot shell script. Unfortunately, this causes the user to be dropped out of X to a black screen while it's removed before switching to GDM or KDM to allow the user to log in for the first time. This provides a bad experience, particularly on slower hardware while this task is running. Set to "Wishlist" as this seems more like a feature request than a bug. I've taken a video to show how the experience looks on a slow box. The first 7:49 or so are all OEM config time where it's spinning and doing stuff. At 7:49, X closes, a black screen comes up, there's a whole bunch of errors (probably plymouth? ), and then a generating locales and then it just sits there. Looks like it's doing nothing. It spends about 1 minute at this screen. This issue effects the first boot user experience and potentially could cause a user to mess up the configuration of the machine by killing it. As from the video above the user is left with a black screen with a ton of errors for just over a minute. If the user kills the machine during that time they will mess up the removal process. Dell expects if this issue cannot be addressed. That errors on the screen, such, as "broken pipe" can be resolved. This also effect the omsk project. At this point in the cycle, the only solution I see to this problem is to remove the feature, then there's no reason to worry about the 1st boot user experience being diminished or users messing up the removal process. However, this is clearly not an option. Adding a graphical feedback breaks several release freezes, and is something we simply cannot afford to do at this stage of the release. We can, however, consider fixing this in 10.04.1, or at the very least, get it into 10.10. This behaviour is indeed very ugly. If it doesn't get fixed in Lucid we'll need to fix it for omsk if we continue down the oem-config path. - does the developer think this is OK to ship? We received no feedback until the bug submitter raised the issue on irc with ev and cjwatson on April 1st, after Beta 2 Freeze (see attachment), and the bug itself was only just opened last week. > does the developer think this is OK to ship? Given ev had no feedback on it, I would assume he did, until being notified on April 1st, and (imo) it would have been hard to consider it very critical, as there was no bug filed. To be clear, I agree this is ugly, but fixing it now is a real risk to the stability of oem-config in general. > and the bug itself was only just opened last week. in the Dell factory environment until very recently. We are discussing a text progress bar solution, if this works, would that be acceptable? There would be a bit of flicker as we have to drop into an ncurses environment, but the messages would be hidden. screen with various errors on it. shouldn't be, and so I think this option carries its own problems. One other option is to simply display nothing at all, but in X. This still leaves the user wondering what's happening, but because it's still in X it doesn't look quite so much as though the computer has crashed. I've committed a change to add a very simple progress feedback window around this, displayed before X is shut down. As promised, it is not integrated into the rest of oem-config nor even in the same style, and I don't expect to have time to do anything about this for 10.04 LTS. I think that it's a fair bit better than just displaying text on a black screen anyway, but if it is nonetheless unacceptable, then I suggest that the best (and probably the only reasonable and feasible) fallback solution for 10.04 would be to display just the X root window while this is going on. I hope my change will be good enough for the moment, though. > else is more risky than just pulling the feature. result of running it every time. > result of running it every time. problems, since in some ways this was a bug fix not a feature). >> result of running it every time. > problems, since in some ways this was a bug fix not a feature). I can't see it in action but it sounded fine - Mario? We are going to roll a package with the commit later today to take a look at how it looks. Don't think we did anything wrong. But the change you made is ok on how it removes oem-config. Besides the "debconf" text on the top bar ..it looks good. The problem is after it is done .. . you drop to a root prompt. The "debconf" text is one of those style problems I mentioned that I can't do much about for 10.04. We should be able to address this for 10.10 (which should maybe be a separate bug, or just a TODO comment, I don't mind). Looks like a simple glitch in my move of code from oem-config-firstboot to oem-config-wrapper/oem-config-remove. I'm not sure why it didn't show up in my testing, but that's why we're doing this a couple of weeks before release! Fix on its way once I've done another straight-through test. Thanks. Just tried with todays build and hit the issue. Still dropping to root prompt. Here is a picture of the error attached. So it appears something *else* is wrong here, judging by all the errors....perhaps this is why Colin is not seeing it. that the bug status is "Fix Committed", not "Fix Released". Confirmed Fixed. 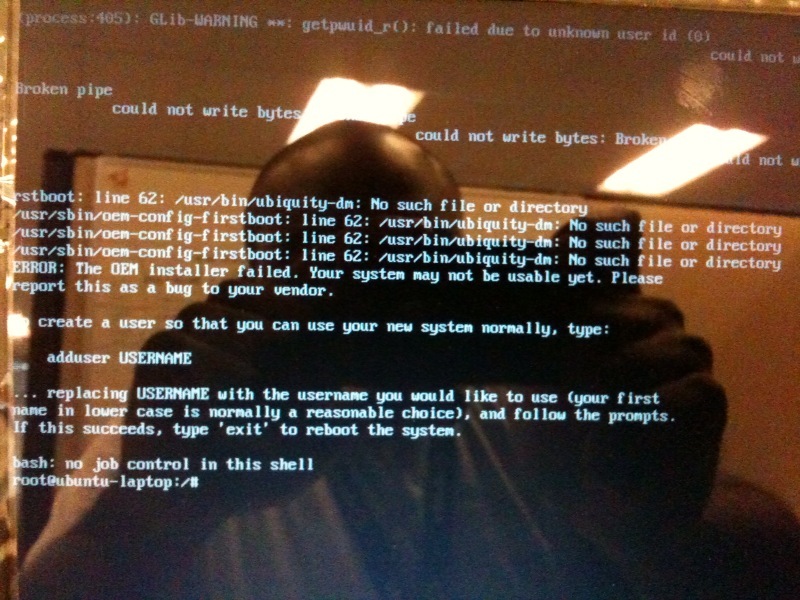 Latest ubiquity fixed issue where oem-config was dropping to root prompt.